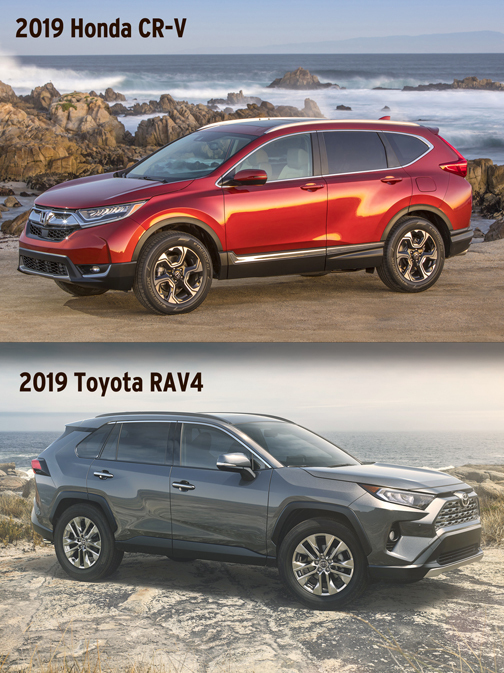 The Toyota RAV4, meanwhile, is redesigned for 2019 with new looks and new technology features. Both offer a comfortable ride quality, lots of available options and impressive fuel economy. But which one will be the better choice for you? We compare them to find out. The CR-V and the RAV4 are similar when it comes to exterior and interior dimensions. There isn’t a clear winner here, but the Honda’s interior has more movable, slidable and clever storage solutions for your small personal items. Folding down the rear seats provides up to 75.8 cubic feet in the CR-V and 69.8 cubic feet in the RAV4. Headroom and legroom in both vehicles are impressive. The CR-V and the RAV4 can fit four adults without issues. A fifth can even be squeezed into the center backseat position without much compromise. At the top of their respective ranges, it’s a similar story with a RAV4 Limited priced at $35,995 and a CR-V Touring – both with all-wheel drive – at $35,195. The Honda CR-V and Toyota RAV4 are excellent choices for a small SUV. They are both comfortable, quiet and reasonably priced. The Honda edges out the Toyota in several categories, ultimately making the CR-V our choice between the two. But the RAV4 Hybrid might win you over if fuel economy is a priority. Travis Langness is a reviews editor at Edmunds. Twitter: @travislangness.